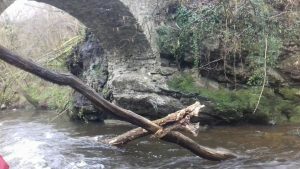 Please be aware there are currently a number of trees in the Mellte at Craig y Ddinas (see attached photographs) – BBNPA and NRW are aware of these and hoping to remove them when they are able. Parking in the area remains a pressure, especially at peak weekends: please continue to park considerately! While the emergency telephone at Cwm Porth is out-of-order, providers using the area should be prepared to go in search of a mobile phone signal in the event of an emergency. 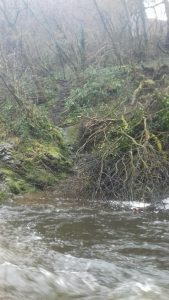 If the river-right access is ‘lost’, groups are asked for the time being to return from Loonies’ Leap up the Gunpowder steps and retrace their route back to Dinas Rock. Groups should not return to Pontneddfechan using the path on river left, until this route can be assessed by a lower plant specialist – nor should they stay in the river downstream of the upper (Loonies’ Leap) footbridge (Along the path there are records of a number of rare bryophytes and lower plants including the scare turf moss, found in only a few sites in the UK and very sensitive to trampling so could easily be lost; In the river requires crossing the NRW weir, which is not designed to be walked over. The weir is very slippery and any fall is likely to result in injury. The rest of the river back to Dinas is shallow and groups are likely to walk on exposed gravels and sensitive mossy stones at the edge of the river). These are all available via our website, for any providers wishing to remind themselves of material covered on our Code of Conduct training sessions. We encourage all Providers to mark at least some of your client’s buoyancy aids in each group clearly with the name of your business / organisation. On Group Leaders in the gorge (we are not prescribing how you should do this – they might for example be attached to the leaders’ bodies, bags or buoyancy aids – but we will be providing free-of-charge a ‘starter set’ of transparent armbands which have been recommended to us following a brief trial by one provider: we can’t offer any guarantee that these will work for you, but can provide details of how to obtain more of them – or you are welcome to try your own alternative methods). If you have not received your expected ID cards within the next couple of weeks, please contact me – and please do let us know how you get on with different methods of displaying them! We’ll be installing new signs (see attached) in the Dinas changing screens and Village Hall to alert clients that their providers should be properly registered (and remind them to take all their belongings and litter with them!). I hope you find these arrangements helpful and not too much of a burden – and wish you all a great 2019 season!